Summary: Faced with deportation, Latka marries a call girl in a quickie ceremony conducted by the bizarre Reverend Jim. Andy: With “Paper Marriage,” Latka Graves becomes the last of the season one Taxi regulars to get a spotlight. To say that this episode is a microcosm of everything that works about the character of Latka and of everything that doesn’t work would be glib, pretentious overreach of the worst critical sort. So let me just say that this episode is a microcosm of most of what works about the character of Latka and most of what doesn’t work. 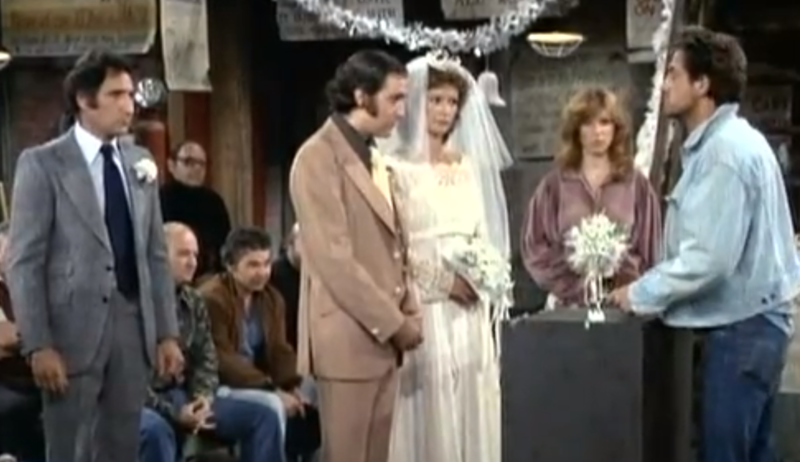 It’s during the wedding ceremony itself that we see glimmers of Andy Kaufman’s true strengths in this role, the ones that made his Foreign Man schtick (from which Latka is loosely adapted) so effective. In lesser hands, this guy could just be a crude caricature spouting vaguely Europe-y gibberish. Kaufman finds the humor and the humanity in subtler aspects though: In the wonderfully expressive, insinuating facial expressions that betray a deeper canniness and enthusiasm eager to burst through the language barrier. That constraint forms an easy ridiculous joke, but it also forces Kaufman’s persona to mine non-verbal communication for all its worth. As he’s being led through the proceedings, he’s nevertheless conveying a rich emotional spectrum through expressions, tone, and body language. I’m never sure how much the other characters are picking up on that—their treatment of Latka straddles a line between sweet and condescending, though Elaine does have some lovely heartfelt moments here, so determined to preserve a shred of emotional integrity even in this sham ceremony. Finally, “Paper Marriage” is a notable episode if only for the introduction of “Reverend” Jim Ignatowski—but we’ll get to him in greater detail next week. Les: Both Noel and I have been somewhat dismissive of the Latka character in previous installments, feeling that he wasn’t too terribly well integrated into the show, but this is certainly the first episode where it’s felt like he’s a part of the ensemble and not just a Kaufman routine inserted to boost ratings. Andy, I disagree with your assertion that he doesn’t seem to demonstrate much agency in this episode, because it seems that he’s the one initiating the schemes this time around, rather than just getting dragged along by the other drivers. It’s his idea to put a decoy pair of overalls under the cab to fool the immigration agents, and his idea to get married to claim citizenship—both of which could have easily been presented as one of Alex’s bright ideas. Even on an emotional level he’s more present than he’s been before, as he’s the one who’s offended at Louie selling him out rather than Alex or Elaine being upset on his behalf. The best way I can summarize what they’ve done here is figured out a way to cross the language barrier. Sure, it’s regularly played as a joke that no one’s been able to understand a word he says, but he’s fully cognizant of what everyone else is saying—this isn’t a Fawlty Towers “I’m so sorry, he’s from Barcelona” language barrier situation. The scene where Latka’s speaking his gibberish and Alex replies as if he understands every word is pretty fantastic, and when Latka proposes to Elaine she certainly gets the gist of the emotions he’s presenting even if she doesn’t understand the import of it. Even in terms of nonverbal communication he’s able to understand the best way to reject the tightwad Louie’s olive branch of $2 is to set it on fire. (Bobby has one of my favorite lines in the episode here: “Kind of wonderful, isn’t it? Never occurred to him to just drop it.”) I give Kaufman a remarkable amount of credit for the way he manages to turn this character, as you say Andy, from crude caricature to someone who can communicate on the wideness of his eyes. Certainly once the wedding ceremony gets underway it takes some of the attention off him, between Louie’s elaborate violin playing and the pop-eyed stare of Reverend Jim, but I was still invested in the emotions of the scene as they unfolded thanks in no small part to the earnest look on Latka’s face. And I also appreciate the way the episode was very direct at the end—Suzanne doesn’t have any epiphany this isn’t right or that she might actually like Latka, she treats it as the business transaction it was and heads off to her next gig at the Hilton. Latka’s reaction to there being no honeymoon is to wearily say “Boy, America’s a tough town,” and that fits in with the levels of resignation all the other characters have expressed at the end of prior episodes when things don’t go quite their way. In that way, he’s earned his place in their world. Cory: This is not the best of the first batch of episodes we have watched. However, it is the one that exceeded my personal expectations the most. You guys both outlined some of the problems our quartet has had with Latka as a character (or something less than that) and while I don’t think “Paper Marriage” solves all the problems present in the first seven outings, it certainly does a rock-solid job of addressing them. Kaufman brings real depth to the table here, so much so that when Latka is left at the end of the ceremony, you feel sorry for him in a real human way, not just a sort of sad puppy-dog way. One of the things that has impressed me about these first handful of episodes is how well the show integrates boilerplate gimmicks into its plots without them seeming, well, gimmicky. Think about it: First episode? Zooming off to an airport for a loved one. Number two? Special sporting event, with a moderately famous guest star. Bobby almost gave up acting in episode four, Elaine threw a party of lies in episode five and “Louie” attended his high school reunion in episode six. If those were the premises for a comedy debuting in 2012, it would get eviscerated on Twitter for being staid and cliche. Doing stories like these equates to being out of creative gas and going this route at the beginning can be even more dangerous. 1978 was obviously a different time (man), and yet, Taxi still proves that certain plots and premises are used over and over again because when done properly, they work really well. Sharp writing full of jokes make up for any fears about too-familiar set-ups, at least for me. Plus, these premises work because they have actually helped us learn a little bit about each character. One might argue that it would make more sense to tell a story about Louie visiting his high school graduation or Bobby giving up acting once the audience has gotten to know them—to make the stakes higher, to channel my inner executive—but Taxi smartly crafted plots that were nice introductions instead of Riff #39 on Louie’s rough childhood, or whatever. Here, we don’t necessarily learn a whole lot more about Latka in terms of pure details but we are able to key into who is, what he wants and what sort of emotional level he operates on. Again, there is really nothing wrong with obvious gimmick storytelling. When it’s done right—like it is here—there is very little to complain about. Noel: I’m still of the opinion that, aside from the little human touches that you all have mentioned, Latka still feels very much like a gimmick, a source of gag-based laughs instead of character-based laughs. I have no issue with gag-based laughs, but in a series that is developing its characters enough, I feel like Latka is the joke and that’s never something that appeals to me. While Les points out that Latka seems to earn his place among the downtrodden dreamers of the Sunshine Cab Company, I don’t have a great sense of what his dream is, even after he admits that America is a tough town. But maybe it doesn’t matter so much since the group rallies around him as they rallied around everyone else in the episodes we’ve seen to help out their colleague. As we’ve hit on before, it’s pretty much just like Community (I even went back to watch the season 2 premiere with the sitcom wedding after watching this) and how the Greendale 7 are always there for each other, no matter what. Latka is one of them, and they help their own survive the indignities of life. Summary: Zena the candy machine girl falls for Louie, but Louie doesn’t know how to date a nice girl. Les: Well, it’s the second season of Taxi, and the wheels are still spinning at the Sunshine Cab Company and its drivers. No major hookups in the last season finale, no shifts in management or character deaths (except of course for John Burns, who died on the way back to his home planet), so the show gets to keep doing what it does best. “Louie And The Nice Girl” is a strong opening to the season, and also our second “before they were famous” glimpse we’ve gotten in this rewatch. In “Paper Marriage” we saw a pre-Back to the Future Christopher Lloyd, and here we see a pre-Cheers Rhea Perlman as the titular “nice girl.” This was a few years before Perlman would charm the hearts of viewers over on NBC with her indelibly caustic portrayal of Carla Tortelli, so I was very pleased to see her playing a character who’s almost the complete opposite, someone who’s on a first name basis with all of the other cabbies and is too shy to even approach Louie. The other thing I noticed about these episodes in comparison to the season one installments we’ve seen before, the humor felt broader than in earlier episodes. Not that it was devoid of the show’s trademark emotional moments or long, play-like scenes, but there were a lot of more openly comedic gestures: Elaine’s increasingly dumbfounded repeats of “Louie? !”, Alex and Elaine’s yelps as Zena implies Elaine wants to date Louie, the out-of-nowhere panicked slam of the door when it seemed Louie had overcome his fears, and Louie’s self-satisfied “heheheh” every time he mentions his girlfriend’s name. (And of course the whole shirtless thing, but I’m trying very hard to look past that.) Did anyone else notice that, and do you think it added or detracted to the show? Personally, I think they hit far more often than they missed, and they still felt integrated with the show’s natural flow. Cory: The biggest compliment I can pay to “Louie and the Nice Girl” is that if you told me that it was episode 10, 15 or 20 of season one, I would have absolutely believed you. Meaning, Taxi hasn’t changed much between the first half of season one and this opening effort of season too—and that’s not a bad thing. The show wasn’t in a Parks and Recreation- or Mary Tyler Moore-like situation where the journey to self-discovery took a bit longer. I respect that James L. Brooks and the Charles brothers didn’t bother tinkering too much. Sure, John’s gone but considering he had exactly zero relevant moments in the seven first season episodes we watched, I’m not sure that is going to be much of a problem. Les, you might have a point about the broader humor. I wouldn’t say it was particularly noticeable but I see what you are getting at. It’s hard for me to call this episode “broad” when last week we talked about an installment that concluded with a majestic 20-second comic set-piece including falling balloons and people tripping over one another. Something to look out for, though. More specific to this episode, I can’t say enough about Danny DeVito’s performance here. We saw some glimpses of Louie’s complexity in the class reunion episode but they are really on display here, as is a multi-layered effort from DeVito (I don’t know, maybe his wife just brings it out of him). From the annoyingly funny “hehhheh” bits to that tremendous conversation with Alex at the dinner table, this was honestly one of the best performances I’ve ever seen DeVito give. Well, other than Twins of course. Something that stood out to me about the premise of “Nice Girl” though is that it’s built around Louie. It was pretty clear from those beginning season one episodes that Taxi was an ensemble show but typically, season premieres are built around the presumed lead character (if they aren’t focused on some cliffhanger, of course). Alex definitely plays a part in this episode’s narrative considering he brings Louie and Zena together (and has to deal with the consequences of that) but there’s no question that this is Louie (and DeVito’s) showcase. It’s not as if DeVito became some big box-office star in the summer between seasons one or two, or that Judd Hirsch almost killed someone with his car (well, as far as I know). I’ll be curious to see if Louie’s prominence sticks. He’s clearly the stand-out character but it’s unclear how that manifests. Andy, Noel: What do you think about this? And to you, Daglas: You played the biggest role in picking what episodes we watched. Why the jump to season two, and why start here? Andy: The episode selection to this point has been based in part on sampling a prominent introduction to each of Taxi’s main characters. Zena’s not what you’d call a main character, even by recurring guest star standards (she only appears five times throughout the series’ run). But Rhea Perlman brings such a delightful presence both to the show and to Louie that I felt we’d be remiss not watching one of her episodes. Much of that is due to two of the reasons Les highlighted: her comic chemistry with her long-time partner DeVito, and the stark contrast between Zena and Carla Tortelli. In some ways, Carla filled a similar role on Cheers as Louie does on Taxi, doling out the insult humor and keeping other characters’ optimism in check (though Carla, unlike Louie, was generally more loved than loathed by her comrades). So it’s great fun to see her here as, basically, the Bizarro Louie. She goes as out of her way to be sweet as he does to be nasty. Why shouldn’t it be a match made in heaven? I see where both Les and Cory are coming from regarding the uptick in broad comedy in this episode. Yet for me one of the funniest moments was a subtle one, as Louie methodically circles the table trying to whisper his braggadocio in everyone’s ear. It’s a winning grab bag of physical comedy—his prowl, Elaine’s stoicism, Tony’s ingratiating grin—within a confined physical space. My other favorite element of “Louie and the Nice Girl” is how the other cabbies, Alex and Elaine especially, are afraid that a happy Louie will somehow be even less tolerable than a grouchy Louie. And naturally, he proves their fears correct. Noel: I’ve been watching Cheers, all of it, for more than a few months now, and even as I type this I’m closing in on the series finale (I’m on episode 17). As a result, I’ve seen over 200 episodes of Perlman as Carla, and while I never thought she was a bad actor by any means, it was great to see something completely different here. Zena is kind (though able to get lecherous, as Les noted) and genuine. Indeed, even though she’s a candy restocker, she doesn’t have the sadness to her life that marks everyone at the garage. She’s a breath of fresh air, a way out of sorts, for Louie. Before I address Cory’s question, I want to talk about that last scene a bit, in Zena’s apartment. Last week Les linked to Jaime Weinman’s piece on the pacing of sitcoms, and that scene not only goes on for a little bit of time but it also feels very much like a one-act play, and I love it. One of the things I miss about the multi-cam sitcom is that a scene can play out, and build to large moments without a lot of cutting. But I also miss actors who know how to play on a stage (as opposed to only on TV), and clearly DeVito and Perlman are veterans who know how to play beats in a proscenium-like setting, giving a whole performance. Burrows must have gotten carried away after that terrific tracking show at the gym in “One-Punch Banta.” In “Paper Marriage,” he stages a very weird shot that starts on a stack of tires, pulls back to a paper bell, and then further back for an establishing shot of the garage dressed for a wedding. Not sure the shot works, but it’s an interesting experiment.